The monotonous steady drone of the baler as it kicks out another bale leaving a cloud of brown dust in its wake, signals another steamy summer of making hay. The dirty hot work of stacking hay in a mow is carried out in the barns all across the country. Statistics provided from the Ontario Fire Marshal’s office show that in Ontario over a five-year period, 924 barn fires occurred with staggering financial losses amounting more than $64 million accompanied with untold emotional pain and suffering. Some years were particularly devastating. 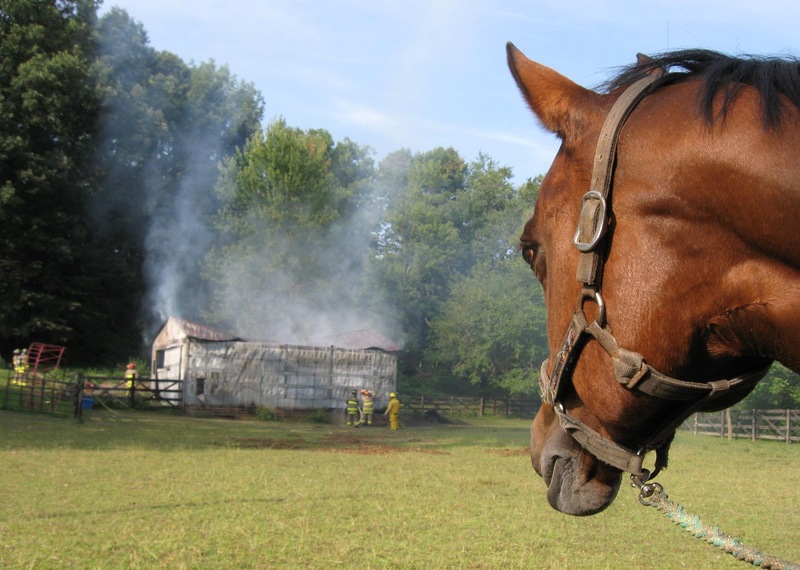 The correlation between weather conditions in a given summer and the number of barn fire investigations is suspected. Preparing to receive and store hay is your first step in managing your hay supply. Simple precautions and common sense practices should be followed. Since cobwebs are considered to be explosive in fire situations, it is prudent to clear and dust your hayloft. Check any electrical wiring including hay elevators and their motor housings and protective shields. Inspect your roof and air vents for leakage that can spoil your hay and contribute to decomposing bales causing hot spots. To help lessen fire risks, hay should be placed on raised pallets and stacked loosely to increase airflow. If possible, stack hay in small stacks 2-3 bales deep. Do not place bales against the barn walls, but allow sufficient space (several inches) for air circulation. Rotate your hay stock, placing older hay in front so that it is used first. Knowing how to monitor your new hay crop that is placed in your loft is the ultimate responsibility of every farm owner to prevent fire. Small square bales of hay that have a moisture content above 20 percent, and large round bales at 18 percent or higher are prime candidates for spontaneous combustion fire. To determine the moisture content in your hay, a common household microwave oven and a small dietary kitchen scale measuring in grams, can be utilized to accomplish this task. The following test can then be performed with great accuracy. Obtain several samples by randomly selecting handfuls of hay from several locations in your hay field. Subdivide the samples to be tested. Place this sample on a paper plate and spread thinly leaving the centre of the plate clear and open. To protect your microwave and guard against igniting the sample, it is recommended that an eight-ounce glass of water filled three-quarters should be placed in the back corner of the microwave during this testing procedure. Heat the sample at a rate of 80-90 percent of maximum power for a period of four minutes. Remove the sample at the end of this cycle, mix and weigh it. Continue to re-heat at two-minute intervals, re-weighing each time. To prevent charring of the sample, use lower heat and 30 second time intervals as it approaches final drying. If the weight of the sample remains unchanged after two or three drying cycles, it is said to be 100 percent dry. This becomes the final dry weight (W2). A slightly burned sample will not drastically affect the accuracy of the moisture determination. However, if the sample burns, the test must be repeated. A large mow with little airflow can produce an internal temperature within a mow that can rise above 130 degrees F (55 degrees C). At this stage, a chemical reaction occurs that produces flammable gases that will ignite when they come in contact with air. If the hay has been treated with a preservative, extreme caution should be used if this hay starts to heat. Hydrogen cyanide gas will be produced at approximately 240 degrees F (115 degrees C) if the hay has been treated with ethoxyquin and butylated hydroxytoluene or BHT. This gas is deadly if inhaled. Tests have proven that the common practice of sprinkling salt on each layer of hay laid down to help draw moisture from the bales, has no benefit in controlling spontaneous combustion. Temperature in a haymow peaks within a week after baling. The decline in temperature is slow, lasting anywhere from two weeks to two months. Several factors such as outdoor humidity, bale density and cut hay that has received rainfall, contribute to the length of time the hay will return to a non-threatening state of combustion. If you detect an odour similar to caramel or a distinct musty smell, your hay is most likely beginning to heat up. By using a hay probe you will be able to assess the internal temperature of your haymow and take appropriate action. The most effective way of determining if your hay is heating up is to make a hay probe. The simplest design is an iron or copper rod about 10-12 feet in length. Place the rod into the centre of your haystack and leave it for an hour or more. Once the rod is withdrawn from the hay, test the warmth of the rod cautiously. If the rod is very hot to the touch and unable to be held in your hands, then you have a problem. Cut a ten foot length of electrical tubing. Fasten a dowel made of hardwood that has been sharpened to a point at one end. Drill a series of 3/16 inch diameter holes into the tubing above the dowel. You will need 6-8 holes. Attach a long string to a candy thermometer that can be purchased at a kitchen supply store for as little as $6. Once your probe is complete, drive the probe into the hay mass. Lower the candy thermometer down the tube and leave it for ten to fifteen minutes in order to obtain an accurate reading. The following temperatures and cautions will assist you in determining if your hay is heating and procedures to follow. · 150 degrees F (65 degrees C) is a warning sign that your hay is at a danger zone. The hay should be checked daily. · 160 degrees F (70 degrees C) will require increased monitoring of your hay every four hours. · 175 degrees F (80 degrees C) requires immediate removal from the hayloft. If you suspect a pocket developing, contact your fire department. A water truck needs to be on the premises since hay exposed to air may flame. In some cases, hosing down the suspected hay prior to removal may be necessary to reduce heat levels. Removing the hay should be done with the use of a logging clam or similar instrument. Once removed from the loft, bales should be placed at a safe distance from the barn. Evacuate your barn, relocating any animals that are housed within to an area that is secure. · 185 degrees F (85 degrees C) is a high alert situation where heating hay that comes in contact with air causing hot spots and possible flames. Keep all doors and openings closed to prevent drafts. In fire cavities of the loft, the potential for collapse when walking on bridged bales is a serious concern. Long planks should be put down before entering the mow to begin work to remove bales. In the event that a haystack collapses, tie a rope around your waist and have a second person available in a safe location to pull you to safety should the situation arise. · 212 degrees F (100 degrees C) is critical. As this temperature continues to rise, the hay will most certainly ignite. Loft fires from spontaneous combustion are not an accident. They are preventable by practicing good hay management.